Most of the times, enamel jewelry pieces look like works of art. They have vivid colors, intricate designs, and a powerful artistic feel. A pair of enamel earrings can offer a touch of sophistication to any outfit, while a delicate enamel pendant will get you noticed in any situation. As you will learn more about how enamel jewelry is made, you will discover that their resemblance to art is not a coincidence. Working with enamel is very difficult and only the most talented and experienced jewelry makers can do it. If you are thinking of buying enamel jewelry, read further to find out everything you need to know about it. How is enamel jewelry obtained? There are two methods to make enamel jewelry. Traditionally, jewelry makers use a fine glassy powder which they heat at very high temperatures. This way, the powder adheres to the jewelry piece, offering it its distinguished look. Besides the heated method, there is also the method of using cold resin. You need to remember these two different methods as they will offer different results. It may surprise you, but people have used enamel jewelry since the ancient times. Ancient Persians, Egyptians, as well as Romans and Greeks used enamel to adorn not only their jewelry but also pottery objects. A great example of enamel artwork are the famous Fabergé Eggs. There are a couple patterns used in enamel jewelry. As you will discover, some of them are more complicated to work with than others. Since we don’t want to bore you with too many details, we have decided to share with you the 5 most popular types of enamel. In the case of Guilloche enamel, the jewelry maker places translucent enamel over a metal that may or may not have a pattern. People also know this technique by the name “engine turned” because the effect will consist of thin, intricate lines into the metal base. In this situation, jewelry makers carve a channel out of the metal base and fill it with enamel. They may choose a simple design or create an intricate pattern. You may recognize this style from Carl’s Fabergé Eggs. With this technique, you can see a large surface decorated with enamel. Most of the times, it represents a portrait, but recent jewelry designs have reinvented this type of enamel. This wonderful, but difficult to achieve enamel type resembles the stained glass. The jewelry maker lays enamel between the metal channels but removes the backing to allow light to enter. Similar to champlevé enamel, this technique uses black enamel. The cavities carved out of the metal are shallower and smaller than in the case of champlevé enamel jewelry. The first thing you need to know when you want to buy an enamel jewelry piece is how it was made. Of course, you don’t need to know about the whole process, but it’s important to ask whether they used the heated or the cold technique. While both hot and cold enamel looks wonderful, usually, heated enamel jewelry pieces tend to be more durable. Another thing to consider is whether the enamel jewelry piece is the work of a designer or a mass production company. Designer enamel jewelry tends to be more personal, but also a little bit pricier. Last, but not least, when buying enamel jewelry, make sure to choose a piece that compliments your style and wardrobe. The classic enamel jewelry picture leads us to art deco or Victorian jewelry. In fact, there are many more styles out there. If you feel that a classic piece isn’t for you, then look for other styles of enamel jewelry. The most important thing is to feel good when wearing your precious jewelry. If you are looking for that perfect enamel jewelry pieces, you are bound to find it in our latest earrings collection. 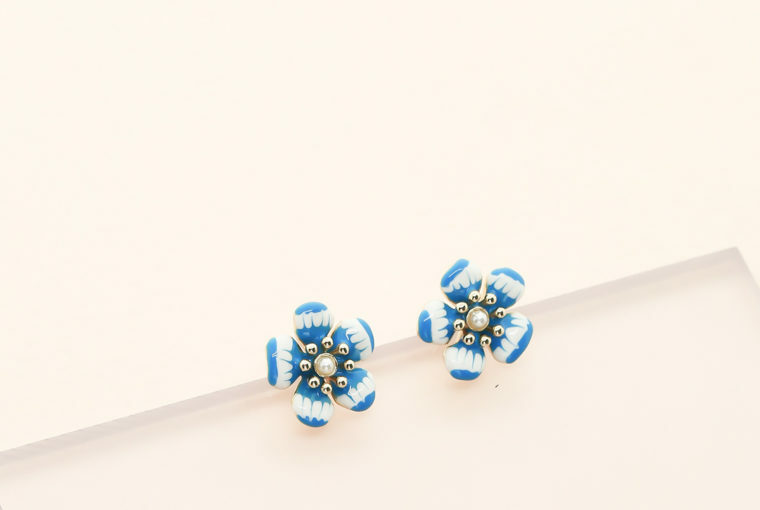 From delicate flower stud enamel earrings to statement earrings, we have a great variety of enamel pieces. 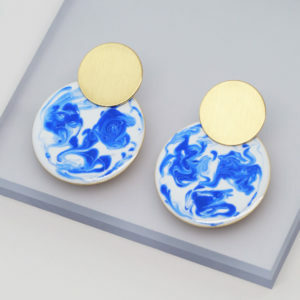 Those gorgeous Kinoko Marble statement earrings will look great on you when you go out for a cocktail or to meet your friends. Just pair them with a simple midi dress, a pair of stiletto shoes and a relaxed updo. If you want to read more about jewelry, browse through our other articles as well. You will discover interesting advice and a lot of important information regarding jewelry. To view our designer jewelry collections, visit Ana Luisa online jewelry boutique. Each of our creations is limited-edition to ensure its uniqueness. Visit our store and discover your next favorite enamel jewelry piece.